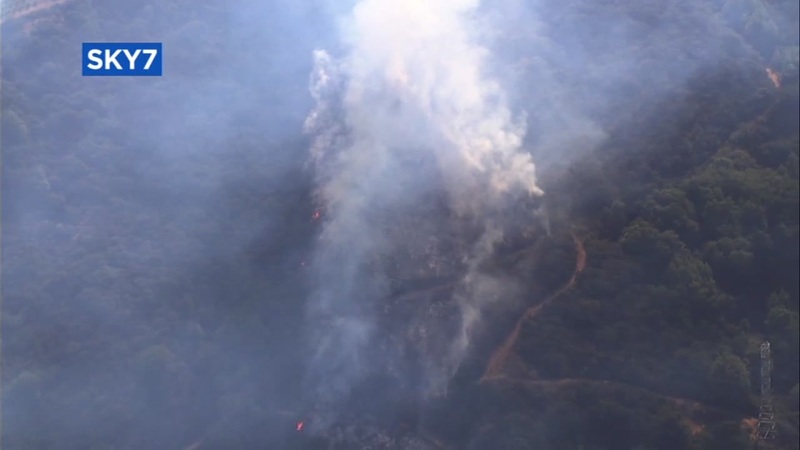 SARATOGA, Calif. (KGO) -- A vegetation fire that began Monday afternoon and has burned 10 acres is close to being fully contained, according to Santa Clara County fire officials. The fire has not burned any structures and no injuries have been reported. Fire officials hope to have the blaze fully contained by the end of Wednesday. Evacuations have not been ordered for residents in the area. A shelter-in-place advisory issued Monday evening has since been lifted, Santa Clara County Fire Department Battalion Chief Jason Falarski said. No roads are closed, but fire officials are asking people to avoid Mt. Eden Road if possible. Firefighters initially had a hard time accessing the area because the terrain is steep and hard to access, Falarski said. About 70 firefighters are working to extinguish the blaze. Chief Fire Investigator Ryan Cronin said power lines have hampered some air operations and the availability of water has also been a challenge. "That impeded operations and put firefighters at risk, Cronin said. "Their operations really hamper our activities." Falarski said the helicopter did not make contact with the drone, but it landed to ensure the safety of crews in the air and on the ground. Fire officials found the drone and the situation is under investigation. Cronin said Cal Fire is in the midst of a campaign to make people aware of the danger drones pose to firefighters during a firefighting operation. Cronin also encourages residents to keep up defensible space around their homes in order to reduce the chance that a fire will damage their home.